Laurence Harvey was born Zvi Mosheh (Hirsh) Skikne in Lithuania in 1928. His family emigrated to South Africa when he was quite young, and he talked his way (he was underage) into the entertainment unit of the South African Army during World War II. 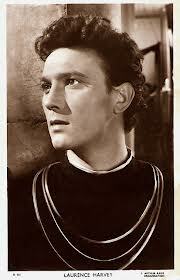 After the war, he moved to London, studying at the Royal Academy of Dramatic Arts. “Room At the Top” made a star of Harvey, who went on to appear in “Butterfield 8” with Elizabeth Taylor, with John Wayne in “The Alamo”, with Jane Fonda and Barbara Stanwyck in “Walk on the Wild Side”, with Geraldine Page in “Summer and Smoke”, and Julie Christie in “Darling”. His most famous role was as the brainwashed veteran/assassin controlled by a scheming and politically ambitious mother (fellow Libra Angela Lansbury) in “The Manchurian Candidate”. One of the interesting things about researching Harvey is the vituperation directed at him. No one seems to be neutral about him! People say he was a wretched actor; some also say he was a wretched human being. Given that his performances in the films I’ve seen him in have been quite compelling, it’s interesting to note that his reputation seems so tarnished. Taking a look at his astrological chart , we see the Sun in Libra and the Moon in Taurus, so he’s very tuned in to Venus (which rules both signs). With Venus situated in sultry Scorpio, this turns up the wattage even higher, so no doubt he was a real charmer –when he wanted to be. It also pointed to his being paired with some of the top female actresses of his era, as noted above. Both Venus and the Moon were among his dominant planets, signifying his creative ability and sensitivity. When he was very young, he was involved with a much older actress, Hermoine Baddeley (Harvey does have the Sun sextile Saturn–an attraction to older people/those with status), and later married actress Margaret Leighton, then Joan Perry Cohn (the very wealthy widow of Harry Cohn, head of Columbia Pictures), and finally, actress Paulene Stone. Harvey also was reportedly bisexual and was said to have been involved in a long-term relationship with his manager, Jimmy Woolf. With his chart, it’s not too difficult to understand his universal appeal! Harvey seems to have been a very complicated character. He had the Moon trine Neptune, and Mars, Venus and Mercury were all sextile Neptune, adding to his charm and giving him that “starry” aura. With a majority of planets in fixed signs, he could probably be very stubborn and unwilling to change entrenched habits. He had the Sun opposite Uranus in Aries and Mars square Uranus, which may have made him quite abrupt and volatile, with a great deal of nervous energy. He also reportedly had an acerbic wit (Mars in Gemini) and a good sense of humor. The Moon-Jupiter conjunction and that intense Venus in Scorpio opposite Jupiter in Taurus can give a “too much ain’t enough” mentality and intensify all urges–reportedly Harvey liked to live above his means, was a card-carrying member of the “Jet Set”, and smoked and drank to excess. This aspect, paired with the fact that Neptune aspects his personal planets, can also indicate the use of substances in an addictive way to escape dealing with the intensity of his own feelings (Also note the planets along the Taurus-Scorpio axis.) The Moon/Neptune aspect often shows a propensity to confused emotions and self-medicating substance abuse. Harvey died at age 45 from stomach cancer.